When I heard that Kristen Simmons was coming out with a new book, even if I wasn’t exactly jumping for joy at the blurb, I needed to read this book–and it didn’t disappoint. Aya is an amazing main character, and I really grew to love her and Kiran. 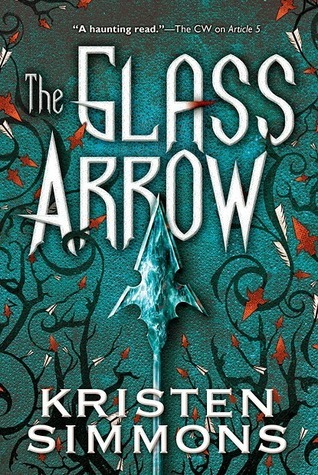 Between the romance and the world-building, THE GLASS ARROW really stood out for me. I loved how much time it takes for Kiran and Aya’s relationship to really grow, and everything they go through over that period of time. I felt like they were perfect together as a couple, and Kiran’s character really appealed to me all throughout the story. Aya wasn’t as great. I loved her, her determination, strength, smarts and realness all stood out to me a lot. However, a lot of Simmons proving how determined Aya is is shown through Aya relentlessly trying to escape and getting caught over.. and over… and over again. It gets kind of old after awhile, almost to the point where it gets a little ridiculous, but other than the drop in the pacing it wasn’t too bad. I wanted things to move as quickly as it gets to in the last half of the book, but the first half takes a little bit of getting through. When it comes to the world-building though, I loved this story. I got to see every single little part of it as a reader, and felt that it was incredibly well thought through. I couldn’t entirely understand what time period it was set in or where really, I may just be missing a few details, but it was okay because of how much Simmons pours into her world. Overall, I would recommend THE GLASS ARROW–especially to fans of Simmons’. This book doesn’t disappoint, and it has breathtaking happy moments just as well as heart-jerking sad parts. There were a few deaths I really regretted, and I wanted a little bit more from the ending, but I definitely will be rereading THE GLASS ARROW. 3.5 stars.